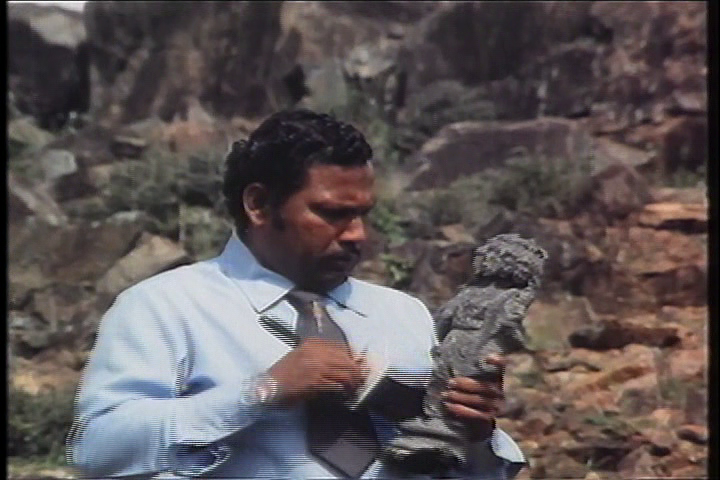 A sophisticated archaeological dig uncovers a priceless idol. 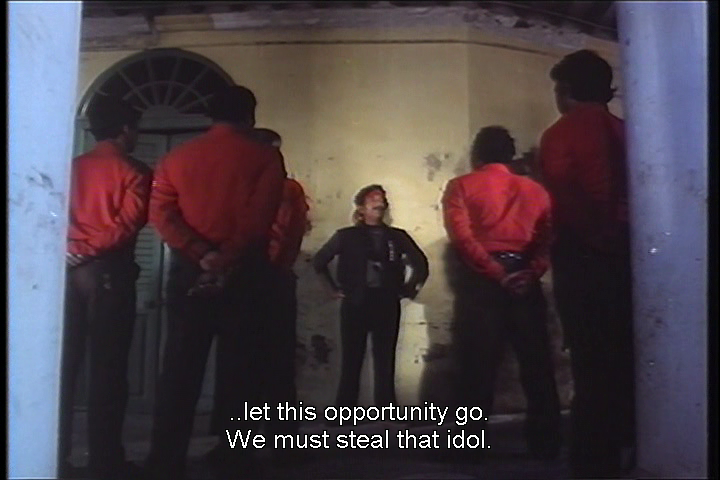 Numerous criminal gangs swoop to claim the prize, and the title of Best Gang Ever. There are men in red shirts v men in white pants v overgrown scouts in khaki. And then a relatively svelte man in black ninjas his way onto the scene – cartwheeling and backflipping like he’d just invented acrobatics. Who could it be?!? 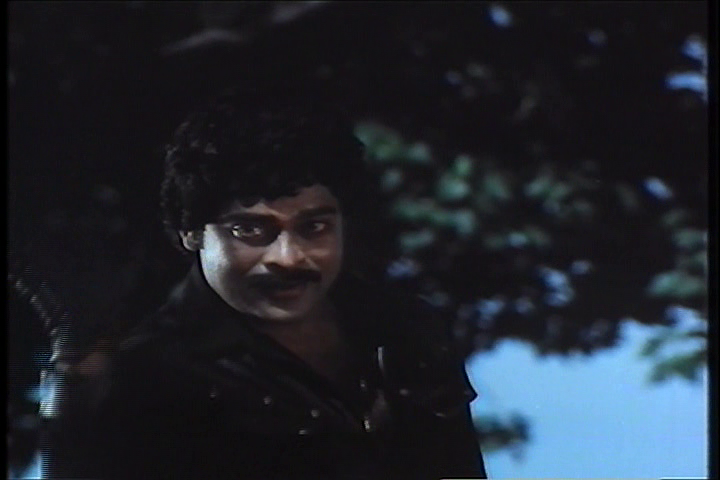 Chiranjeevi teams up with A Kodandarami Reddy again for a mass film with a few little tweaks on the standard formula. There are multiple identities, daring deeds, family histrionics, a significant mole, and a lot of prancing around in parks. Kalidas (Chiranjeevi) is the up and coming star of a crime gang. 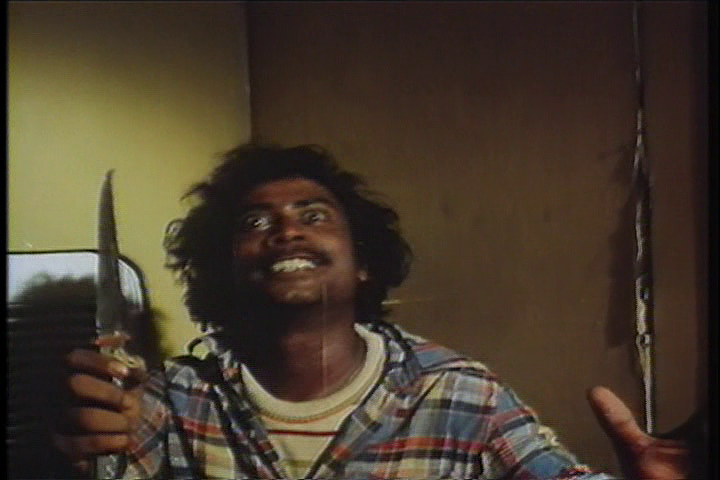 Kali is confident and quite happy with his lot which seems to include Mohini (Silk Smitha), the chief’s daughter. He has a fearsome reputation, a tight perm, and blue contacts. He represents the meritocracy while the leader’s nephew Kasi prefers nepotism to ensure his career progression. He and Kali have an excellent and yet not very good at all blindfolded fight to the (almost) death which I found oddly compelling and quietly soporific. The lair is a cave with odds and ends of lounge furniture picked up on hard rubbish collection day. And despite being top secret and underground, apparently anything that goes on is clearly audible in Kali’s lounge room. A series of unfortunate events triggered by the jealous Kasi sees Kali leave gang life to go straight. 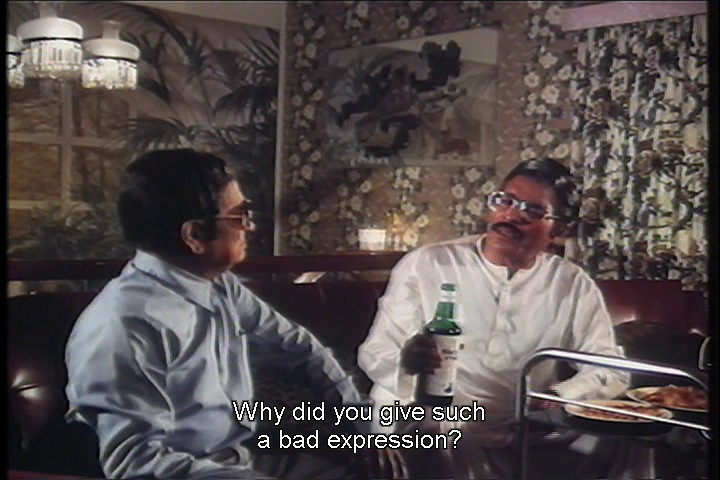 Kali rebrands himself as Raja a pop singer with much better hair, and coincidentally meets SP Anand (Satyanarayana Kaikala) on a train. 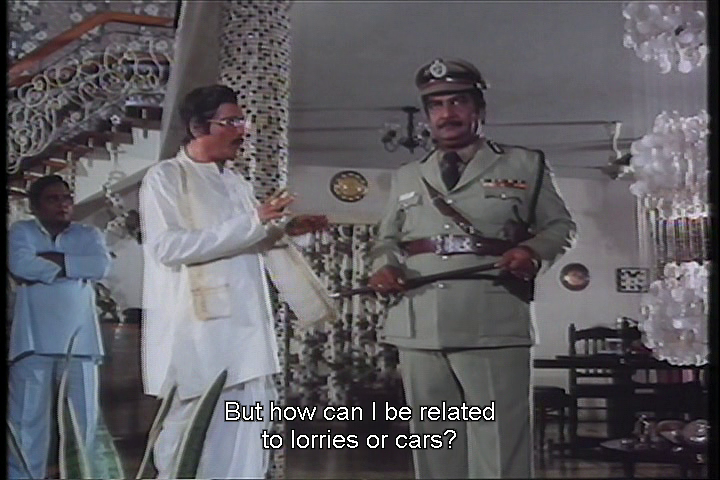 Cue flashback and the genial policeman is Raja’s father, back when he was a little boy called Ravi. Ravi was involved in an accident resulting in a neighbour losing his sight, and his furious dad chased him down the road firing warning shots over his head. So I can kind of understand the kid being terrified of his father catching up with him. 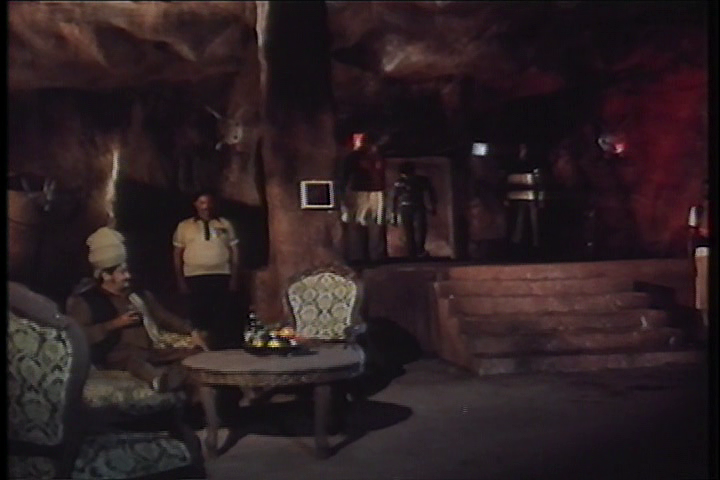 Raja saves SP Anand from goons sent to kill him, and SP Anand makes Raja stay in his home. Will they ever recognise him? Will he tell them? Will they overcome evildoers and lively happily ever after? 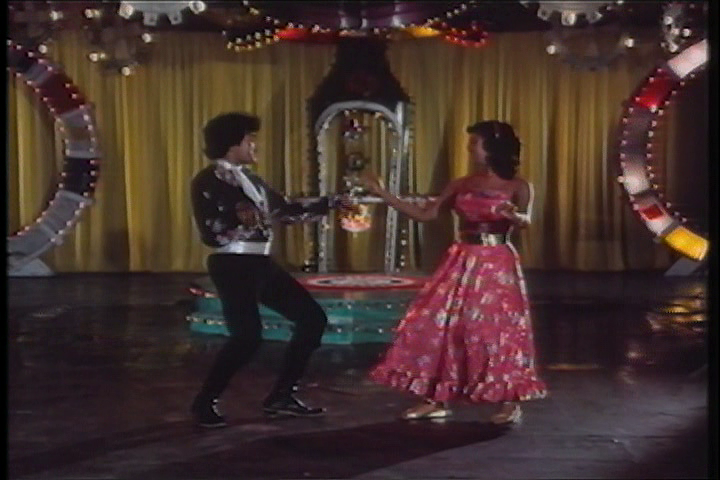 Raja gets a job at the nightclub owned by baddie Kasiram (Allu Ramalingaiah), where Jaya (his childhood intended played by Radha) sings. I do enjoy a bit of disco yoga classical fusion. 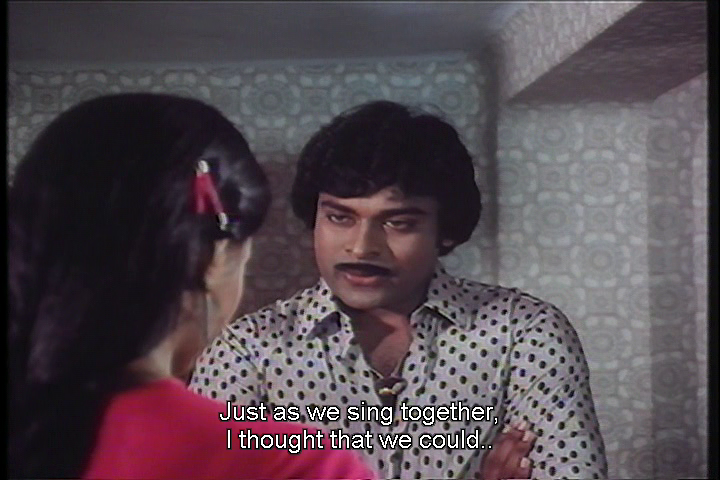 I am less in love with Chiru’s wardrobe, which seems to be sourced from the ladies floral blouse department. While growing closer to Raja, Jaya reveals her intense hatred of Ravi, the child who destroyed her family. Raja decides he has to win her love as his new self, and fix everyone else’s life into the bargain. Will they ever recognise him? Will he tell them? Will they overcome evildoers and lively happily ever after? Thankfully Raja likes to get his shirt off, so Jaya recognises the Significant Mole. After some angst and a little bit of PR from the gossipy doctor, she and Raja resolve their differences. Love arrives differently for us all. Sometimes it is wearing a Blondie t-shirt. 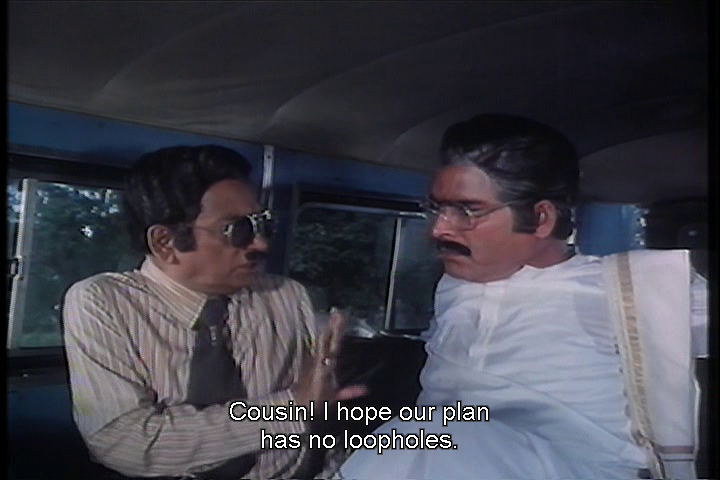 Raja decides to secretly protect his dad, although he still won’t tell his family who he is. 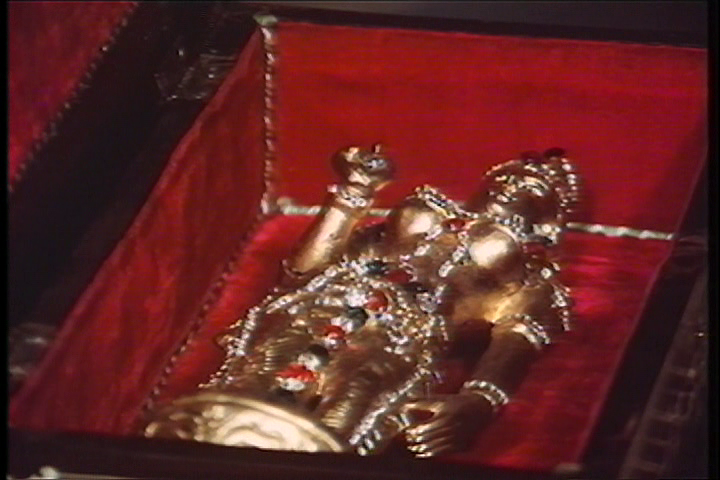 But Dharmaraju has tracked down Kasi, a witness to Raja’s past. Will they ever recognise him? Will he tell them? Will they overcome evildoers and lively happily ever after? Raja utilises his old Kalidas skills to get the money for Jaya to settle a debt, and he is the anonymous benefactor behind a sudden offer of an eye transplant to restore her dad’s vision. 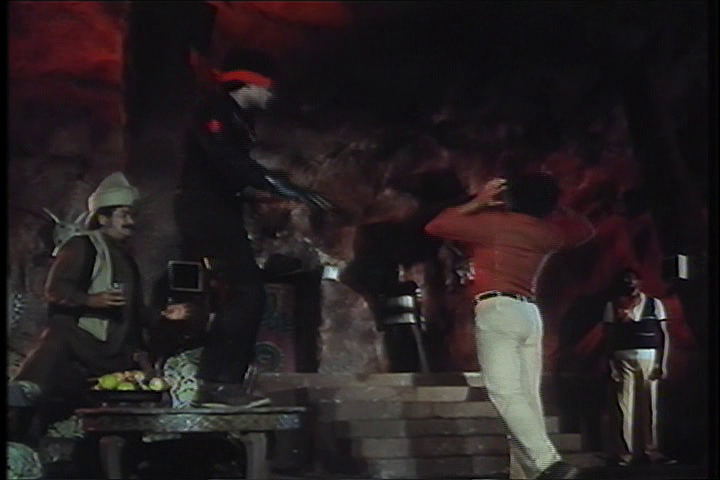 Raja’s fighting style is as flamboyant and flexible as ever, so the action scenes are loads of fun. There is an excellent train sequence where it is clearly Chiru himself (at least for most of the time), leaping from carriage to carriage and flinging his opponents to the winds. As is often the case in Telugu films, justice is not clear cut and may reside outside of the legal system. SP Anand has to deal with the consequences of his temper, both in the past and now he knows his son has returned. 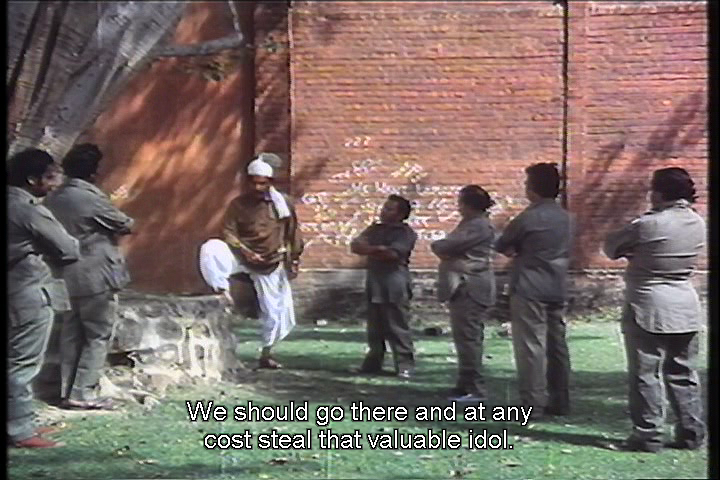 And Raja has to pay for Kalidas’ actions. I liked that no one really escaped from themselves. It’s a good way to mesh a family drama with a revenge motif. 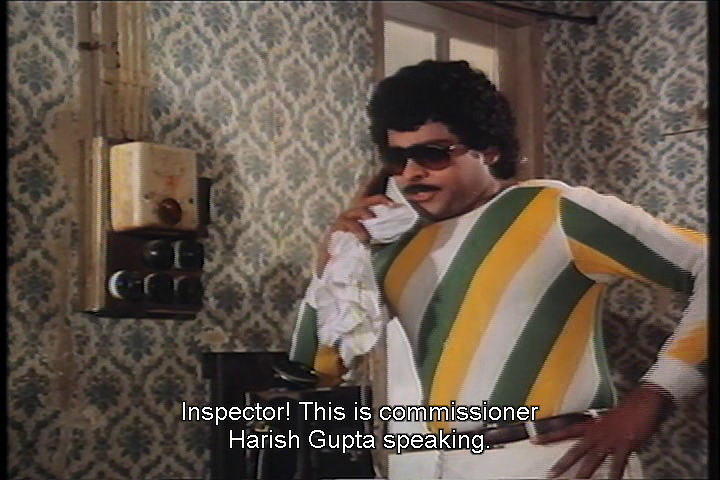 The multiple identities give Chiru a good excuse to switch up the wardrobe options and he imbues each character with a different emotional tone. Kali is never conflicted about being a crook, and his change of lifestyle was more to please his father figure. He certainly managed to heal his wounded heart in record time. Poor Mohini – forgotten in just one dance sequence. Raja has firm views on Jaya’s brother Srinu being a wastrel and tells him he has no right to eat if he doesn’t earn his own way. Which is interesting in light of his criminal past but maybe he saw that as honest work, and better than taking money from a WOMAN. The horror! His views on the role of women are typical of the age and genre, but he does understand why Jaya mistrusts him and that he needs to give her evidence before she would change her mind. 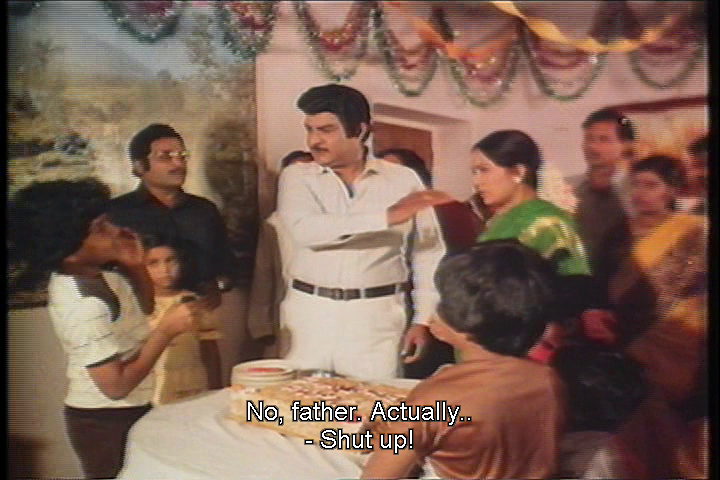 And despite his love for his estranged family, Ravi also sees that his father was very unfair. He doesn’t examine his own decision to jump off a bridge too closely, but you can’t have dazzling insights into everything. 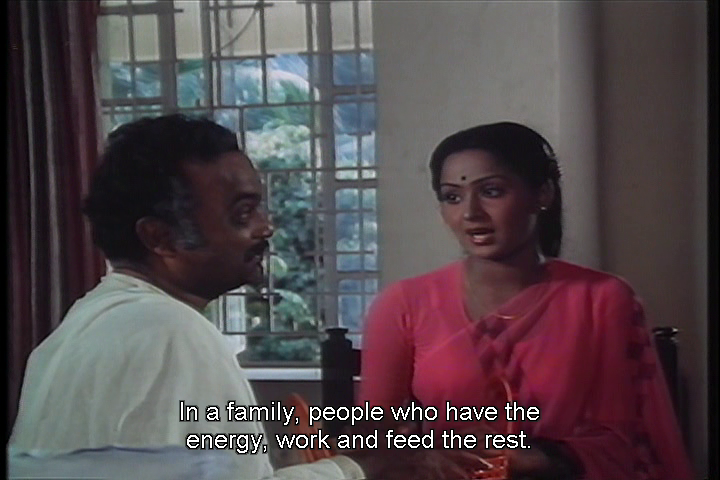 Jaya has a bit of backbone, and Radha always has good chemistry with Chiru. When she realised who Raja was, she was furious and articulate in rejecting him. And when she changed her views, she was again articulate and clear in what she wanted to happen with their relationship. She is a typical filmi heroine but I could respect that she was making some of her own decisions. The wardrobe team do torment her in some dance sequences, and I suspect they even repurposed Kali’s perm wig. In a way she is the character that triggers Raja into action. He could have made do with seeing his family occasionally under the guise of friendship, but he fell for Jaya and so he had to do something to gain her trust and affection. Allu Ramalingaiah and Rao Gopal Rao are the muddling but nasty crims who run the club and there is an ongoing subplot of both stupidity and cruelty at their behest. 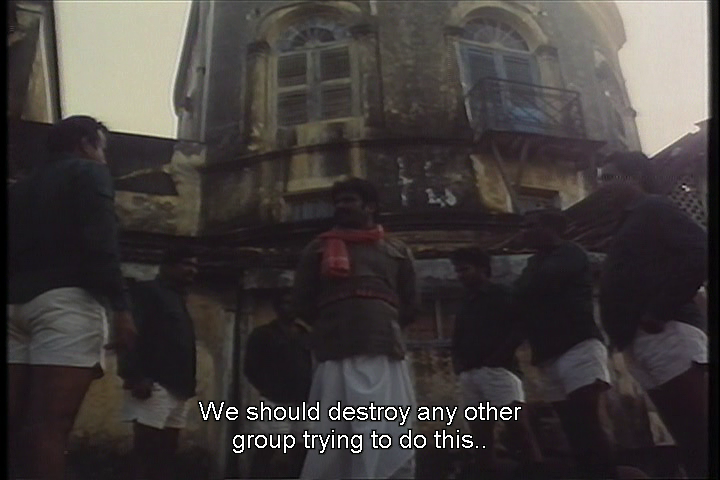 There is also a large cast of supporting goondas, many of whom seemed most animated in their death scenes. Satyanarayana Kailkala and Annapoorna do what they have done so very many times as Ravi/Kali/Raja’s parents. 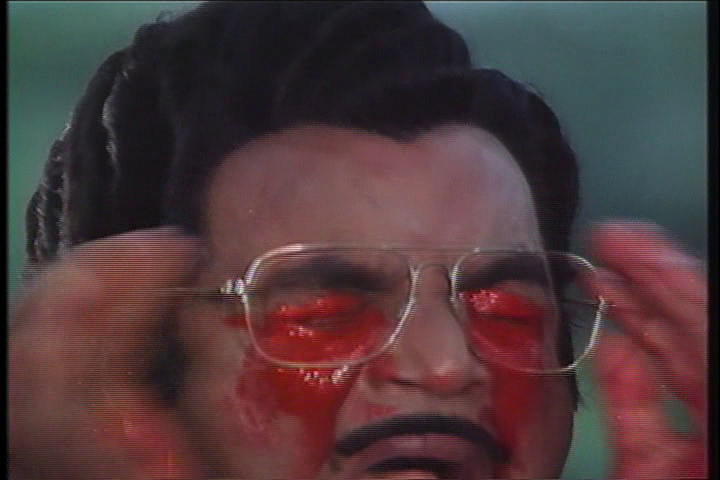 Silk Smitha’s role was small but she did get to wear some fabulous sequinned shorts so she made an impression. 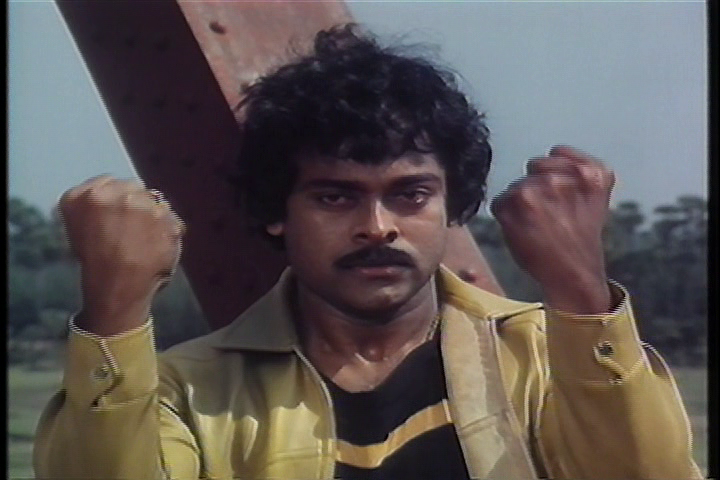 Despite being full mass formula, Goonda is a bit more low key and contemplative than some of Chiru’s other hits. 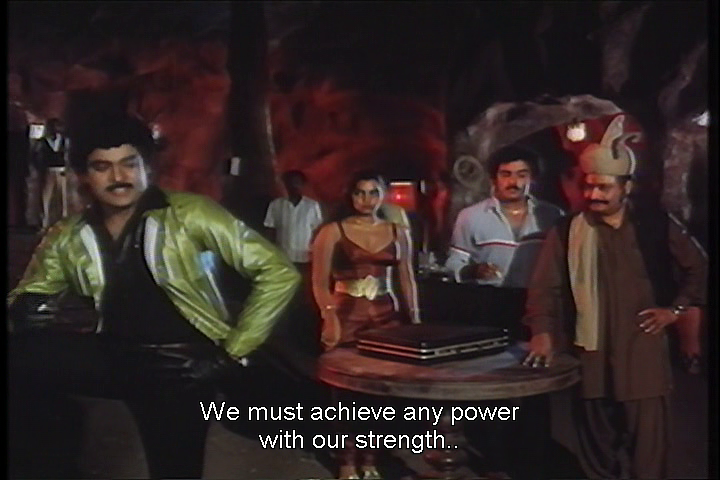 The music and choreography is a bit lacklustre, especially considering that Chiranjeevi and Radha were no slouches in the dance department. 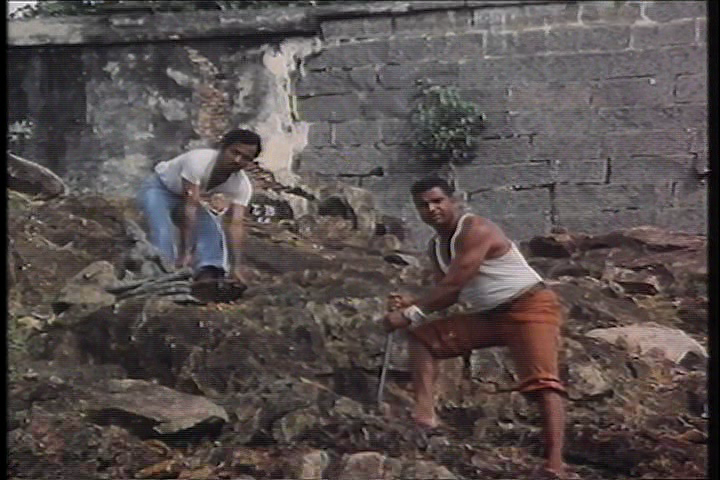 The set design and costumes also show the spirit of making do. I think they spent all the big bucks on the train. 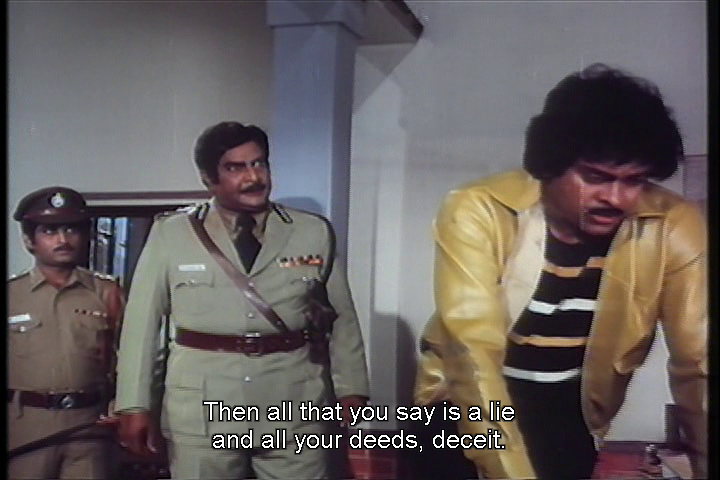 See this for truth, justice, and two kinds of Chiru! 4 stars! This entry was posted in Tollywood and tagged A. Kodandarami Reddy, Allu Ramalingaiah, Annapoorna, Chiranjeevi, Chiru, Kaikala Satyanarayana, Radha, Rao Gopal Rao, Silk Smitha, Telugu. Bookmark the permalink. I cringe at most 80’s movies, I’m probably never going to watch them. But your reviews are entertaining for sure. Those names are confusing as hell! 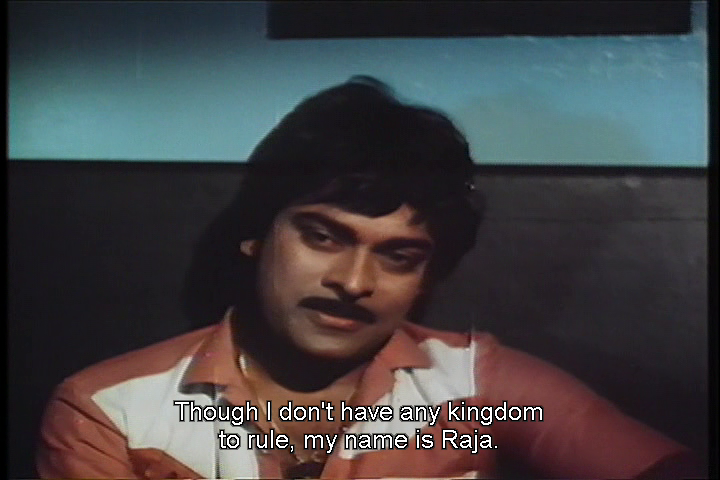 Thanks for clarifying that Kali/Raja/Ravi are all Chiranjeevi. 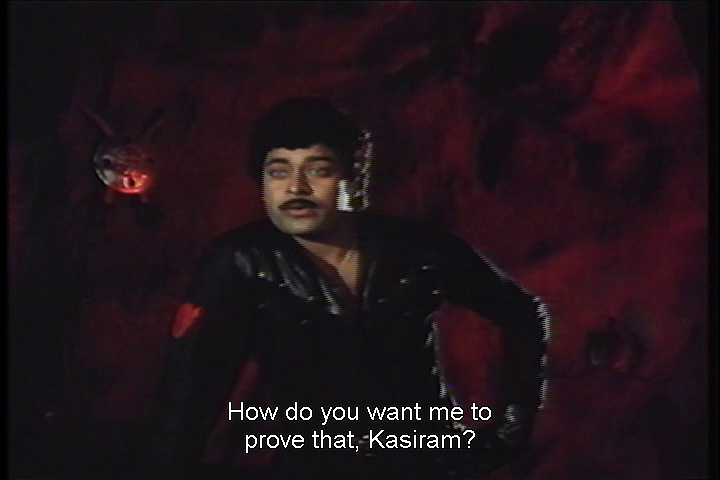 There’s a Kasi who fights with Chiru when he was Kali? And Allu Ramalingaiah is also called Kasiram or something? 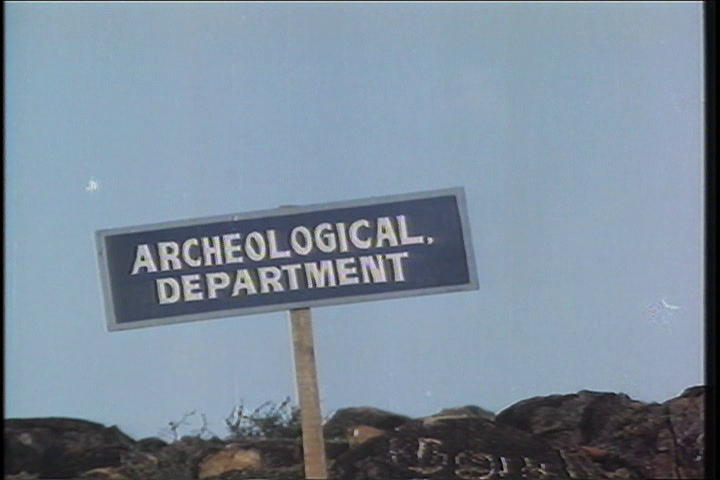 They came up with three names for Chiranjeevi, could think of less confusing names for other characters! Sigh! 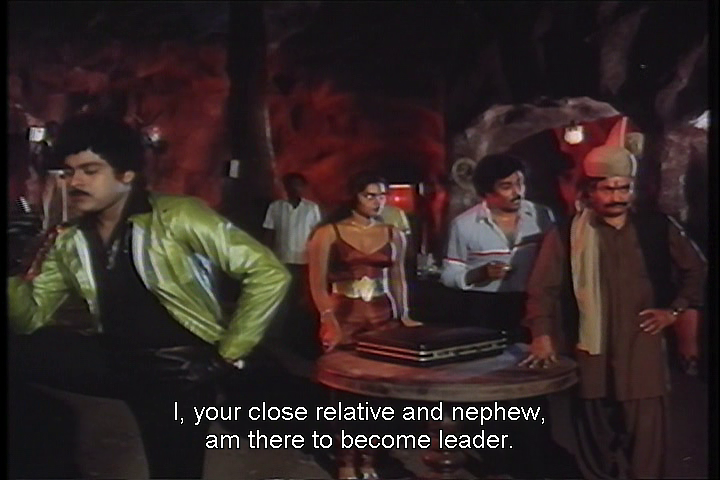 Thanks Spandana 🙂 I was relieved to find a copy of this with subtitles, otherwise I’m sure I would have lost track of Which Chiru Is That!